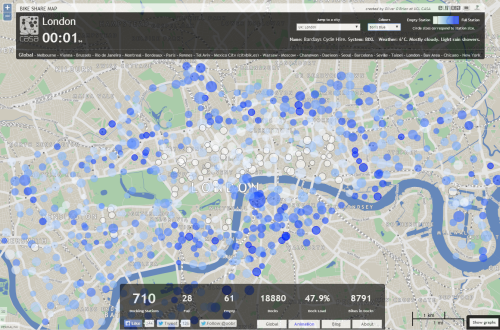 Developed from an initial version showing London’s bike share scheme in 2010, Ollie O’Brien has developed his map to provide links to around 100 similar schemes across the globe. Technically, the work showcases the potential of tapping into real-time data feeds that makes the map not only interesting but truly purposeful. The one key aspect that web mapping offers is the ability for a map to update when data changes. Here, O’Brien demonstrates how to harness that and create a genuinely useful information product which captures change approximately every 2 minutes. The map itself takes a standard thematic proportional symbol approach that indicates size of the bike station and uses colour (which can be modified to your own liking) to show whether a station is relatively full or empty. The addition of statistics on each bike station (revealed by a mouse roll-over), the overall statistics for a city, usage graphs and animations that show the ebb and flow of daily use patterns add to the utility of the map. Here, detail is the key and the map gives the user a number of different ways to consume it as well as modifying the viewing experience. More detail on Ollie’s site here. This entry was posted in MapCarte and tagged MapCarte, thematic, web map by @kennethfield. Bookmark the permalink.